If this is the first time you're reading about this module, it's simple PowerShell module that allows you to verify whether your IP address is on a blacklist or not. As you may know (or not know) there are over 80 blacklists run by multiple companies, organizations and having IP on their lists can cripple your mail flow heavily. Whether it's Microsoft Exchange or some other type of SMTP server, having an IP address that has a decent reputation is a must. This module won't fix your status but, it will allow you to monitor if your IP ever gets added to one of those lists so you can act upon it. This new version takes old features and builds on top of it. 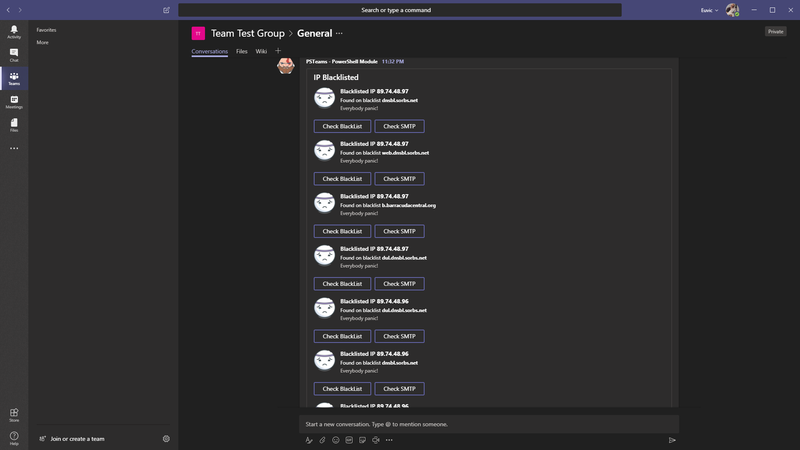 It now can send notifications to Microsoft Teams, Slack but it's a bit faster, especially on a higher amount of IPs to check. This version changes your CONFIGURATION file. If you use this module already, please check new version below. NoWorkflowAndRunSpaceNetDNS – Basic check. Doesn't use WorkFlow or Runspaces. Uses [Net.DNS] command. NoWorkflowAndRunSpaceResolveDNS – Basic check. Doesn't use WorkFlow or Runspaces. Uses Resolve-DNS command. WorkflowWithNetDNS – Basic check. Uses WorkFlow. Uses [Net.DNS] command. WorkflowResolveDNS – Basic check. Uses WorkFlow. Uses Resolve-DNS command. RunSpaceWithNetDNS – Basic check. Uses Runspaces. Uses [Net.DNS] command. RunSpaceWithResolveDNS – Basic check. Uses Runspaces. Uses Resolve-DNS command. Results of searching for 4 IPs on about 80 blacklists. As you can see below Runspaces are much faster to what is offered by Workflow and to what is available without it. What's a bit surprising is that [Net.DNS] is faster on Runspaces than Resolve-DNS at the same time losing heavily with Resolve-DNS when using Workflow. Of course, there may be some other conditions that play it, or maybe some small differences in implementation but it would seem Resolve-DNS is a bit slower than using Net.DNS but I still decided to use it due to modern functionality. With just 1 IP the differences aren't as visible and are a bit different allowing Resolve-DNS to score few points more in comparison to Net.DNS. Of course, Runspaces win this one too. Actually, for Runspaces there seemed to be marginal change. In the end, it all doesn't matter. This tool is supposed to run in the background and doing this every 1 hour or so. Just in case you would like to test this out yourself be my guest. If you find inconsistencies in my testing, please let me know! As a heavy user, there could be no PSBlackListChecker without support for Microsoft Teams. If IP appears on a blacklist, it sends you a notification to channel of your choice, along with two buttons. First one allows you to confirm your findings on MxToolBox, the second one checks SMTP connectivity (also using MXToolBox – great tool btw!). 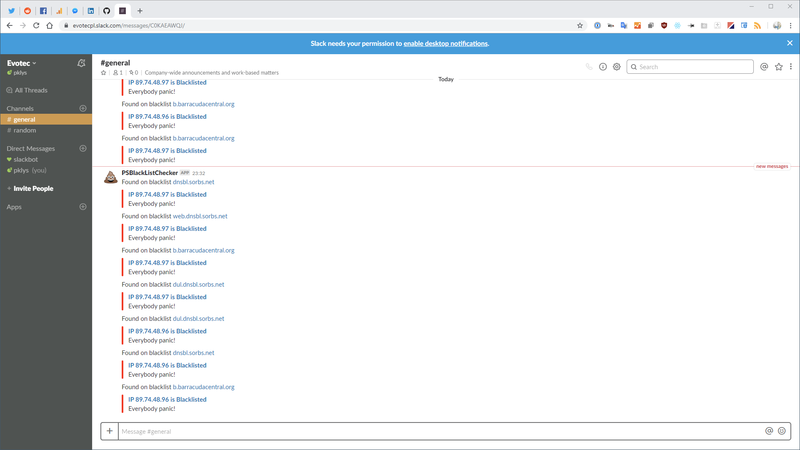 Keep in mind that if you setup Scheduler to check for Blacklists every 5 minutes or every 1 hour, you will keep on getting notifications until your problem is solved or task scheduler is turned off. There may be a feature in future that would be able to detect this but not yet. While I don't use Slack myself, I heard it's a good piece of software, so I'm adding it here. If you think display can be better feel free to contact me on GitHub and make a PR so we can improve the experience for everyone. When IP appears on the blacklist, you can also click Title of the message, and a website MXToolBox open. A new version, new configuration file. While old one still should work to use new features you should use the newest version.